Has the garage become your home’s storage locker? Even if you have it organized with freestanding shelves, you might discover that a lot of clutter in that garage could be tossed out. This might mean dedicating a few hours to sorting through every box but it’ll be time well spent when you can reclaim that valuable storage space. What happens when create a pile of rubbish from your garage that’s too big for the trashcan? It’s time to bring in Junk King Portland. Junk King Portland is part of a national chain of professional junk haulers who have been in this line of work for over 12 years. In that time, they certainly have seen their fair share of cluttered garages. Actually, clearing out a garage is very easy for junk King. All they have to do is back the truck up to the door and start loading. Your part in all of that is to simply point to the things you want taken away. A garage is also a spot where a lot of heavy things go. This is where you’ll find old furniture, appliances and the occasional treadmill. If none of those things are being used, then why are you holding onto them? Turn it all over to Junk King Portland. When Junk King Portland collects rubbish they don’t put it on a scale. That’s because they don’t charge by the pound. Instead it all comes down to how the going to pack up the truck. The crews can look over any pile of junk and know exactly how much space it will need on the truck. That is the estimate that they will provide to you before the work gets started. It’s a flat fee that covers all the labor, transportation and disposal. If you were to price out this job you would find that it cost almost 3 times more than what Junk King is charging. If you are hesitant about tossing your stuff into a landfill, then know that Junk King Portland is on the same page. They would much rather drop your stuff off at a charity or recycling center. They’re all about being as eco-friendly as possible. 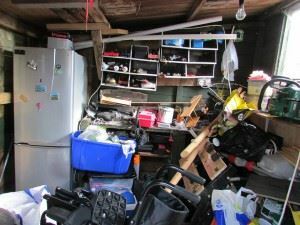 Getting your garage cleared out just takes one call to Junk King Portland. Make that call today. This entry was posted in Portland junk removal and tagged clutter, garage, junk King, rubbish, storage on August 31, 2017 by Junk King. Last updated September 1, 2017 .